Religions have always been associated with particular forms of knowledge, often knowledge accorded special significance and sometimes knowledge at odds with prevailing understandings of truth and authority in wider society. New religious movements emerge on the basis of reformulated, often controversial, understandings of how the world works and where ultimate meaning can be found. Governments have risen and fallen on the basis of such differences and global conflict has raged around competing claims about the origins and content of religious truth. Such concerns give rise to recurrent questions, faced by academics, governments and the general public. How do we treat statements made by religious groups and on what basis are they made? What authorities lie behind religious claims to truth? How can competing claims about knowledge be resolved? Are there instances when it is appropriate to police religious knowledge claims or restrict their public expression? 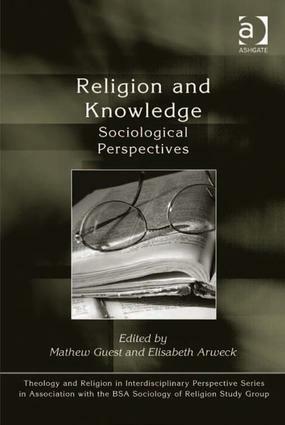 This book addresses the relationship between religion and knowledge from a sociological perspective, taking both religion and knowledge as phenomena located within ever changing social contexts. It builds on historical foundations, but offers a distinctive focus on the changing status of religious phenomena at the turn of the twenty-first century. Including critical engagement with live debates about intelligent design and the ’new atheism’, this collection of essays brings recent research on religious movements into conversation with debates about socialisation, reflexivity and the changing capacity of social institutions to shape human identities. Contributors examine religion as an institutional context for the production of knowledge, as a form of knowledge to be transmitted or conveyed and as a social field in which controversies about knowledge emerge. Contents: Religion and knowledge: the sociological agenda, Mathew Guest; Part I Institutions of Knowledge: Reified knowledge about ’religion’ in prisons, James A. Beckford; Faith and the student experience, Ian Fairweather; Young people in mixed faith families: a case of knowledge and experience of two traditions?, Elisabeth Arweck and Eleanor Nesbitt; The Amish in North America: knowledge, tradition and modernity, Elisabeth C. Cooksey and Joseph F. Donnermeyer. Part II The Religious Knowledge Economy: New atheism as identity politics, Teemu Taira; Rejection or accommodation? Trends in evangelical Christian responses to Muslims, Richard McCallum; Knowledge, tradition and authority in British Islamic theology, Stephen H. Jones; Choosing my religion: young people’s personal Christian knowledge, Sylvia Collins-Mayo; Safe and risky readings: women’s spiritual reading practices, Dawn Llewellyn; Intelligent design as a science enabler: prolegomena to a Creationist left, Steve Fuller; The influence of fundamentalist beliefs on evolution knowledge retention, Ryan T. Cragun, Deborah L. Cragun and Jason Creighton; The sea of faith: exemplifying transformed retention, Douglas Davies and Daniel Northam-Jones. Part III Knowledge, Religion and Academic Endeavour: On the materialization of religious knowledge and belief, Peter Collins; Bracketing out the truth? Managing bias in the study of new religious movements, Rebecca Catto; Index. Dr Mathew Guest is Lecturer in Theology and Society at the Department of Theology and Religion, Durham University. He has published widely on contemporary British evangelicalism and on Christianity in general, including contributions to Theorising Faith (ed. Arweck and Stringer, Birmingham: University of Birmingham Press, 2002), The Encyclopedia of New Religious Movements (ed. Peter Clarke; London: Routledge, 2004), Studying Local Churches: A Handbook (ed. Cameron et al; London: SCM, 2005), Redefining Christian Britain: Post-1945 Perspectives (ed. Garnett et al, London: SCM, 2007), A Sociology of Spirituality (ed. Flanagan and Jupp, Aldershot: Ashgate, 2007), The Oxford Handbook of the Sociology of Religion (ed. Peter Clarke, Oxford: OUP, 2009) and Reading Genesis After Darwin (ed. Barton and Wilkinson, New York: OUP, 2009). He has co-authored Modern Christianity: Reviewing its Place in Britain Today (with Douglas Davies; Reading: South Street Press, 2000) and Bishops, Wives and Children: Spiritual Capital Across the Generations (with Douglas Davies, Aldershot: Ashgate, 2007), has co-edited Congregational Studies in the UK: Christianity in a Post-Christian Context (with Karin Tusting and Linda Woodhead; Aldershot: Ashgate, 2004), and is the author of Evangelical Identity and Contemporary Culture: A Congregational Study in Innovation (Milton Keynes: Paternoster, 2007). Dr Elisabeth Arweck is Senior Research Fellow at the University of Warwick (Institute of Education). She is a member of a number of national and international learned societies in religious studies and the sociology of religion. She is a Council member of the International Society for the Sociology of Religion. She is an editor of the Journal of Contemporary Religion. She has co-edited a number of volumes, including Reading Religion in Text and Context (with Peter Collins) (Ashgate 2006), Materialising Religion (with William Keenan) (Ashgate 2006), and Theorising Faith (with Martin Stringer) (Birmingham University Press, 2002). She is the author of Researching New Religious Movements in the West: Responses & Redefinitions (Routledge, 2007) and co-author (with Peter Clarke) of New Religious Movements in Western Europe: An Annotated Bibliography (Greenwood Press, 1997). She has published a number of articles in journals (with Eleanor Nesbitt), book chapters, and entries in handbooks and encyclopaedias.